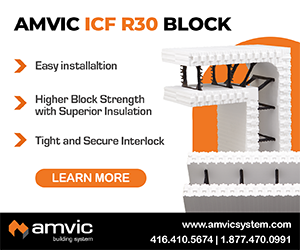 A range of ICF-friendly finishes exist that are reasonably priced, easy to apply, and look great, while withstanding nearly every threat imaginable. In standing up to Mother Nature’s worst—hurricanes, tornadoes, and fire—the exterior finish is almost as important as the wall itself? 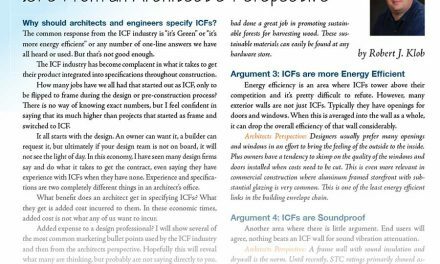 Luckily a range of ICF-friendly finishes exist that are reasonably priced, easy to apply, and look great, while withstanding nearly every threat imaginable. One company manufacturers a ballistic-grade stucco that claims to be literally bulletproof, even stopping rounds from an AK-47. Even if the project isn’t in a war zone, there’s a host of reasons you may want to consider these ultra-durable finishes. Careless lawn trimmers, errant golf balls, and other hazards can damage a home’s finish. And in the commercial sector, warehouses, factories, and restaurants with drive-through lanes will appreciate a finish that can withstand an occasional bump from cars or forklifts. Perhaps the most durable finish is masonry. Whether it takes the form of brick, cultured stone, or actual quarried rock, this finish will withstand the elements for centuries. (See Alternative Wall Finishes in the Dec. ‘06 issue). They look great, and best of all—because the structural wall is foam and concrete instead of OSB and lumber—moisture and mold are virtually non-existent. They are absolutely fireproof, and can withstand nearly all wind-driven debris. 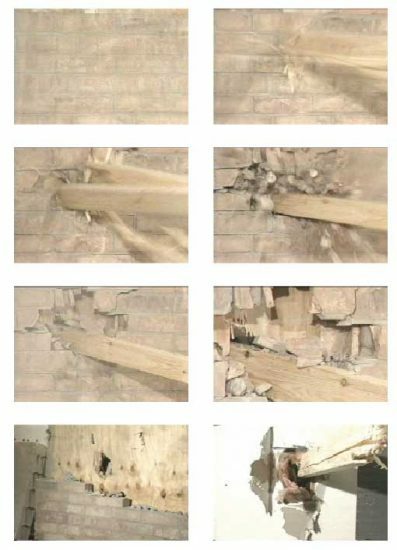 In air cannon tests conducted by Texas Tech University, the brick façade fractured only when the 8’ long 2x4 projectile impacted at speeds of more than 60 miles per hour—conditions that only occur within extremely strong tornadoes. Quarried stone is even more durable. The only drawback to masonry veneers is that they are among the most costly to install and repair. Siding has a mixed record on durability. Vinyl and metal siding cannot be considered durable, considering how easily they crack or dent. Similarly, wood products’ flammability and constant maintenance rule them out. Fiber cement siding, on the other hand, has proven to be a cost-effective, disaster resistant option. They’re available in a wide range of color and style options, and are virtually indistinguishable from quality cedar siding. 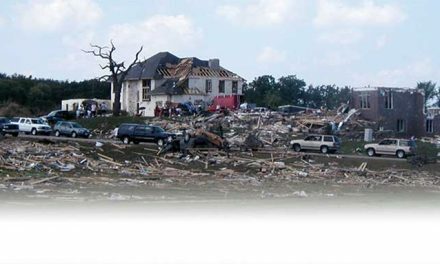 Cement siding also has an excellent record on disaster resistance. 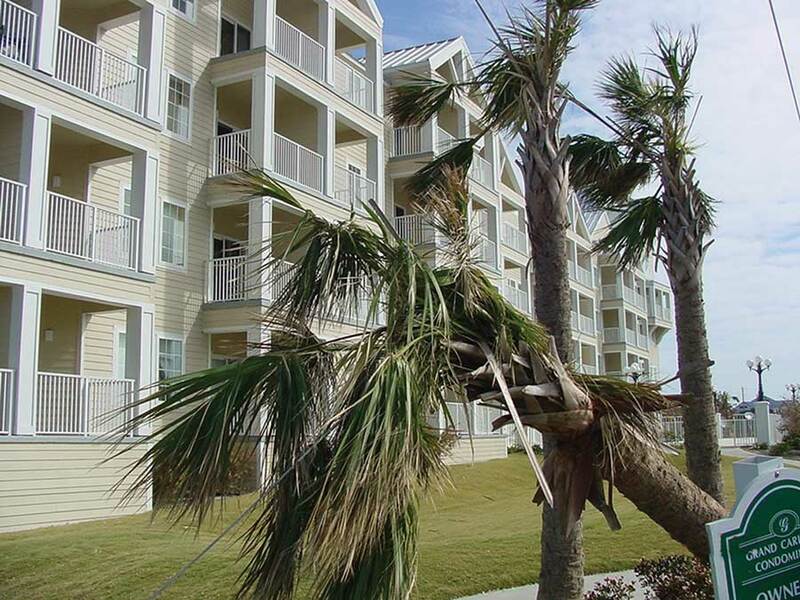 Used on the Grand Caribbean Condominiums in Gulfport, Miss., the finish has withstood two hurricanes with virtually no damage. It took a direct hit from Hurricane Ivan in 2004. Despite winds reaching 125 miles per hour, damage was limited to a few improperly fastened planks. The material has also proven its fire resistance, withstanding wildfires in Nevada and California, and arson in Kansas City. (See related story on page 22). In the Kansas City incident, gasoline was actually splashed on the planks, but they still did not catch fire. 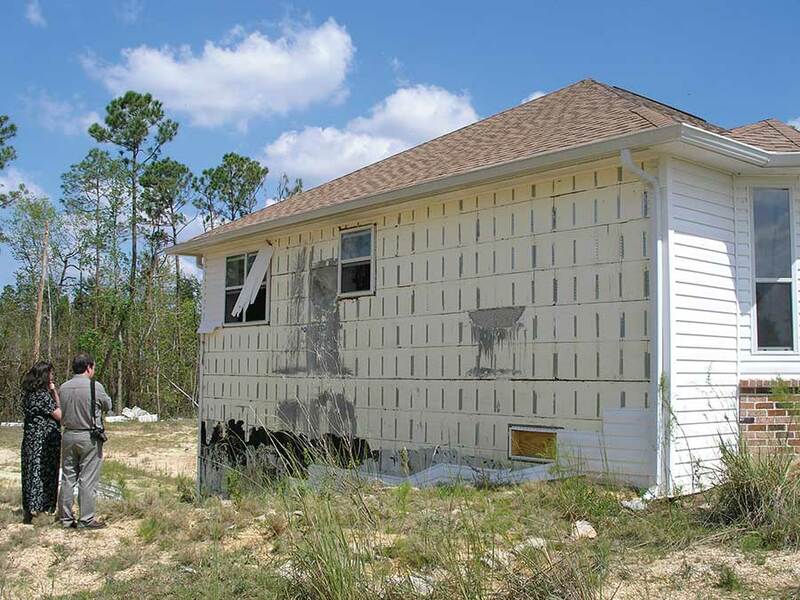 Despite a direct hit from a category 3 hurricane, the fiber-cement siding on this ICF condo stood up extremely well, losing only a few improperly installed planks. 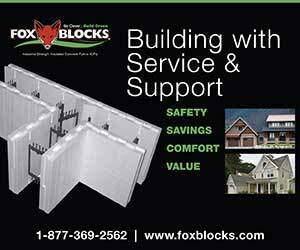 Perhaps the easiest finish for ICFs is also one of the most durable. 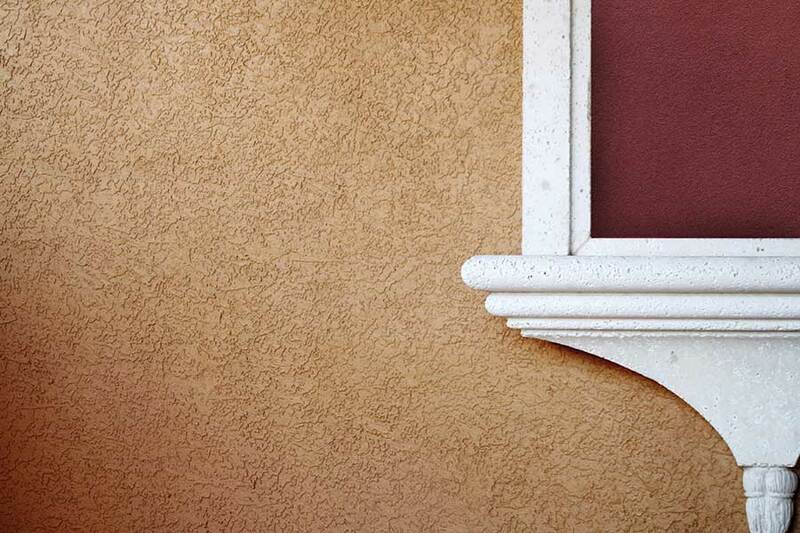 Stucco and acrylic stucco can stand up to the very worst of the elements, and are extremely easy to apply (See Keys to a Great Stucco Finish in the June ‘05 issue). Several recent innovations have made this type of finish even more durable than ever before. 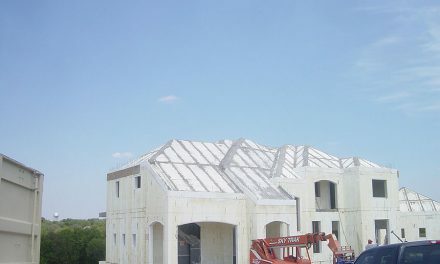 Up to 6,000 PSI: PermaCrete is one finish with a proven track record in the ICF industry. It’s one of the strongest, with a compressive strength of more than 6,000 psi. According to George Pinger, vice-president of sales, it’s 10 to 12 times stronger than the typical EIFS coating. 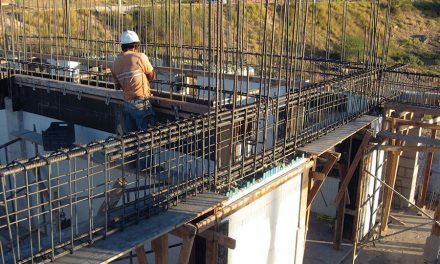 A true cement-based coating, PermaCrete can be spray-applied with a hopper gun directly on the ICFs, and is the only cementious coating code-approved for both vertical and horizontal applications. Another advantage: The base coat can be colored to match the finish, which makes repairs harder to spot. Fights Stains: Dennis Rose, technical director at Total Wall, offers another option. 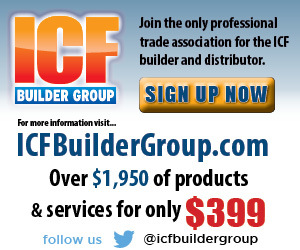 “Our Tuff-II system, custom developed for ICFs, has taken off like gangbusters; it’s even surprised us,” he says. “It’s a medium-hard acrylic that has incredible strength, with silica powder for immense density,” he continues. ‘We’ve added a broad spectrum preservative to fight fungus, and use non-chalking titanium for maximum brilliance. It doesn’t have much lime or limestone in it either, which keeps efflorescence down.” Made with 100% acrylics, the polymers keep dirt and stains off. “In a disaster situation this is a very positive thing,” says Rose, noting the trait also comes in handy for day-to-day living. Coatings in high-traffic areas often need tougher finishes. Damage such as this vandalism can be repaired. However, double mesh or a stronger finish could have prevented it from occurring. One final advantage: Because it’s a synthetic, it doesn’t harden in the pail, so the homeowner can keep a small amount on hand for any minor repairs that do need to be made. “As long as it doesn’t freeze, or get above 100 degrees, it will last years. It melds with itself quite nicely,” he says. Old-World Finish: One recent entry to the ICF finishes market is Sider-Oxydro. For extra impact resistance, Burgand recommends using hi-impact mesh closer to the ground. “You could also go to six ounce mesh if you want,” he says. If the base coat is built up to a ¼ inch, Burgand says the finish will withstand virtually any accidental impact. Withstand a Forklift: A final option is Oro Coatings. “ If you follow the installation correctly, this coating simply will not crack unless there’s major structural failure,” says Chris Tidwell, marketing director for the company. “Whenever there’s a question of durability, double up the mesh—usually just the bottom six feet—and it will stand up to anything. “The one thing that I really like people to understand is that it will stand up to abuse, its extremely durable, but it’s also environmentally friendly. It uses 48% recycled materials, but it performs like its all virgin. The price point of the product is about the same price as a regular stucco, but can add 3-9 LEED credits just by using Oro. When Hurricane Katrina roared through Gulf Shores, Miss., the Wilkerson’s ICF home stood strong, although the vinyl siding on one side was torn to shreds. Disaster-resistant finishes span the full range of architectural options. From brick, stone, and cement-board siding to modern stuccos and acrylic finishes, they can achieve any look the designer wants while still providing protection and peace of mind for the homeowner. When selecting any finish, the decision typically revolves around colors, textures, and price. But maintenance and durability should also be considered, even if the region is not prone to natural disasters. The same qualities that let these finishes stand up to fire, bullets and wind-blown debris can also resist the wear and tear of day-to-day living. A finish that doesn’t dent, crack, stain, or puncture will reduce maintenance, eliminate repairs, improve appearances, and help the occupants enjoy greater peace of mind. 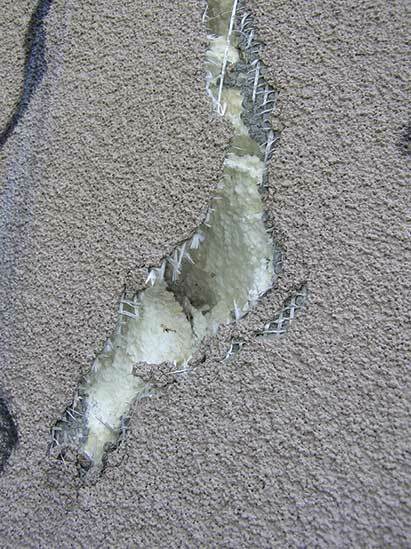 Despite being hit by an out-of-control driver going 90 mph, the coating on this ICF wall required only minimal patching.